USPS Delivery Confirmation is now USPS Tracking. Previously, when you borrowed books by mail from the APRL, you received a green Delivery Confirmation label. 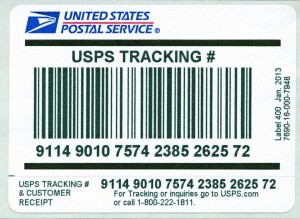 Now, you will receive a black and white USPS Tracking label to use. Unless otherwise requested, please return books to us by Media Mail with USPS Tracking ($.90 at a post office or $.20 online). Please save the customer receipt attached to the bottom of the label as we may need this to track the shipment. We will continue to send books to you at Library Rate with Signature Confirmation, unless you request and pay additional postage for Priority, or First Class shipping.